Jeanne Strickland was only twenty-five when she, along with a partner, started her first healthcare service company, Package Computer Systems, Inc. (PAC-COMP). The success of the company was due to their commitment to understanding their customers’ needs for managing compliance with federal and state programs and using information technology to reduce the administrative burdens of operating a healthcare practice. After ten very successful years, the business was sold and Jeanne maintained a consulting practice while collaborating with another start up business exploring the use of the internet and its ability to impact healthcare delivery between hospitals and patients. This second career led to her involvement with organizations such as the American Medical Association, American Hospital Association and other healthcare leaders. After several years of consulting at the University of Michigan, Jeanne joined the health system as their privacy director in June of 2003. 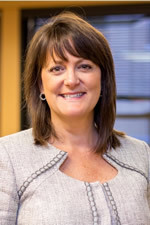 Jeanne was named Chief Compliance Officer for the health system in October 2003 and continues in her role as HIPAA Officer for the University. In July 2004, Jeanne also became the Chief Compliance Officer for the Hospitals and Health Centers and Michigan Healthcare Corporation and in 2008, for the Medical School. In August 2007, Jeanne was appointed Health Information Technology Commissioner (representing Hospitals) by Governor Granholm and served a 3 year term. In 2014, Jeanne was selected as a National Peer Reviewer for the Association of American Medical Colleges. Jeanne is a guest lecturer for the UM Graduate Medical Education Program, UM School of Nursing (adjunct faculty), UM School of Pharmacy, UM Law School, the Institute for Continuing Legal Education, Eastern Michigan University, and a frequent speaker at various professional associations including being the 2010 key note speaker for Michigan Society for Medical Research.